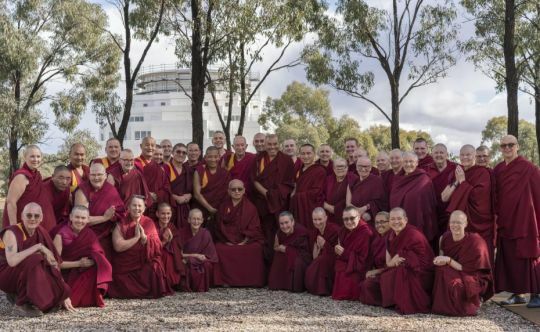 Lama Zopa Rinpoche with the geshes and Sangha attending the retreat at the Great Stupa of Universal Compassion, Bendigo, Australia, May 2018. Photo by Ven. Lobsang Sherab. Founded by Lama Yeshe in 1974 at Kopan Monastery, the International Mahayana Institute (IMI) is FPMT’s community of monks and nuns. IMI Sangha members serve in the FPMT organization as registered teachers, directors, spiritual program coordinators, editors, and more. On July 16, FPMT’s sixteenth annual International Sangha Day, we celebrate and thank our Sangha. Ven. 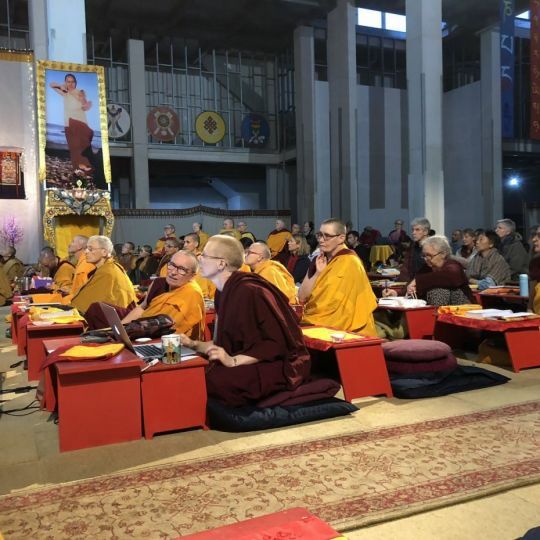 Losang Tendar, IMI director draws our attention to our aging Sangha members, a topic highlighted by Lama Zopa Rinpoche on April 7, 2018 during the Bodhicaryavatara and Rinjung Gyatsa Retreat at The Great Stupa of Universal Compassion in Bendigo, Australia. Lama Zopa Rinpoche with Ven. Thubten Gyatso, Ven. Tenzin Tsapel, Ruby Karmay, Ian Green, and Ven. Thubten Tendar at the Great Stupa of Universal Compassion, Bendigo, Australia, May 2018. Photo by Ven. Tenzin Tsultrim. 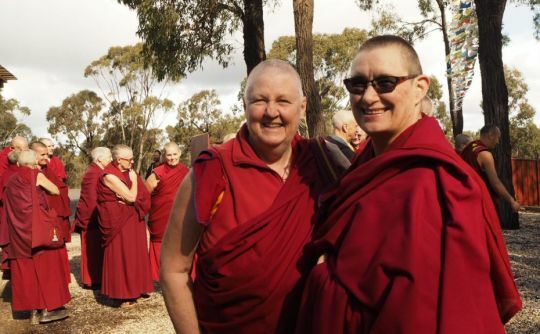 During the retreat in Bendigo this year, Lama Zopa Rinpoche brought up the topic of our aging Sangha members. 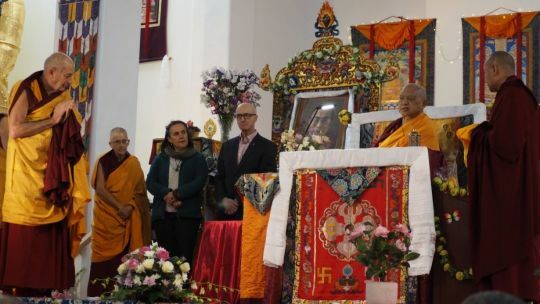 He spoke about many older students, who have dedicated so many years—their lives—to developing and building up the FPMT. Rinpoche said we can see how this has brought benefit to sentient beings. Nuns inside of the gompa during the retreat at the Great Stupa of Universal Compassion, Bendigo, Australia, April 2018. Photo by Ven. Roger Kunsang. He said in the past we have had meetings about how to help the Sangha when they become old, but we did not come up with a workable solution. He joked, “we had meetings numberless times.” Rinpoche advised that from time to time we should have discussions and meetings to talk about obstacles, difficulties, and solutions. Ven. Thubten Lhundrup and Ven. Michael Losang Yeshe offering tsog during the retreat at the Great Stupa of Universal Compassion, Bendigo, Australia, May 2018. Photo by Ven. Lobsang Sherab. Rinpoche said the Sangha will age like this soon. He presented the idea that we should organize for the Sangha, and that this needs some discussion. He said the Sangha will need help. Ven. Tenzin Nangsel and Ven. Tenzin Palyon at the Great Stupa of Universal Compassion, Bendigo, Australia, May 2018. Photo by Ven. Tenzin Tsultrim. Suggestions for celebrating International Sangha Day include reciting the Sutra for Remembering the Three Jewels; showing respect for and appreciation of monastics; generating a deeper awareness of the Sangha Rare Sublime One; and making a donation to the Lama Yeshe Sangha Fund. Watch recordings of Lama Zopa Rinpoche teaching during the Bodhicaryavatara and Rinjung Gyatsa Retreat at The Great Stupa of Universal Compassion in Bendigo, Australia, March 30-May 12, 2018.